For the architecturally interested and inclined, the Zumthor-designed spa in Vals is a top-of-the- bucket-list destination. It doesn’t disappoint after decades since it was built. The spa sits perfectly in its context not because it is designed similar to the surrounding village, but because it’s spirit and materiality is part of its serene landscape. 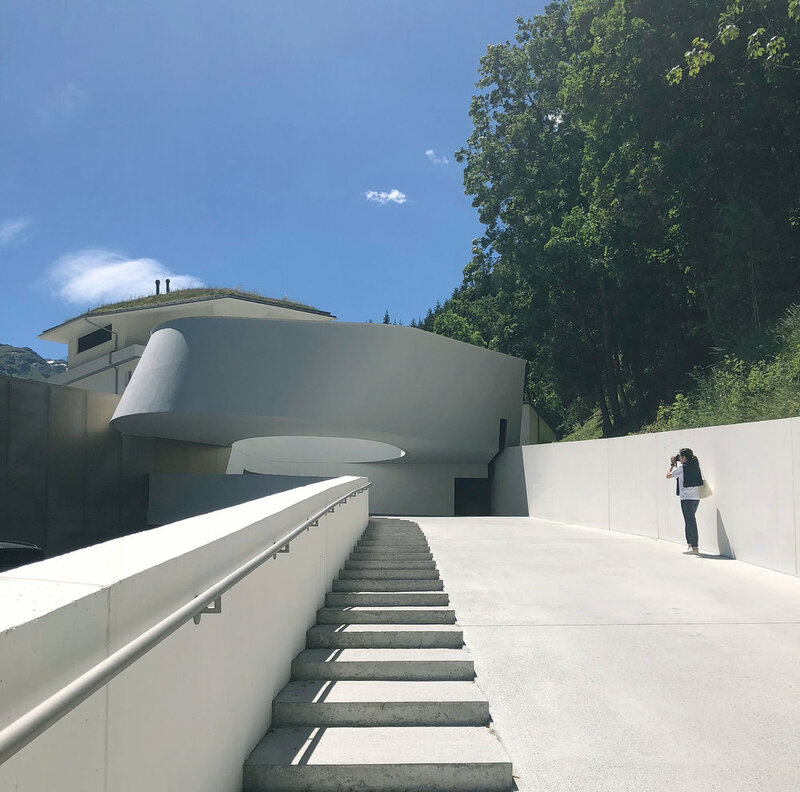 The Therme Vals and Kunsthaus Bregenz, completed just a year apart in 1996 and 1997, put Pritzker Prize laureate Peter Zumthor on the world stage, but both are just part of an oeuvre that reflects a sense of materiality, space and light. His work is traditionally modern (I know that sounds a bit counter intuitive), more Alvar Aalto than Norman Foster, if you will. The spa is a part of the 7132 Hotel complex located under the the “House of Architects,”. Our rooms were in this building which features rooms designed by famous architects. One of us stayed in the Kengo Kuma room and the other in the Tadao Ando room. The rooms are small but efficient. They reflect the serenity of the place with no distraction. No televisions or radios here. Bring your ipad and a speaker if you need entertainment. The Ando Room was light-filled with a window as canvas - the view to the mountainside is spectacular. There’s a small platform with meditation mat as well as tiny balcony. Everything is tucked into the walls (it took me a minute to figure out how to open cabinets) and super organized. You won’t have room for a bunch of suitcases, that’s for sure - and no luggage rack. Space is tight, but you’ll not mind it. The Kuma room was like an armadillo shell built inside a room, it is also tight and well organized but the subtle details keep your eyes moving around the room. It seemed odd to have a clear glass shower in the middle of the room but you see the alignment to the sliding glass doors and hillside views. If you are particular about bathroom layouts look at each room carefully to select which would work best for you. Both rooms were comfortable for one person, two people and luggage will skew the zen/spa aesthetic, so look into the rooms in the 7132 building. The Thermal Baths, which were originally put practice in 1826, are therapeutic for body, soul and aesthetic sensibilities. You cannot photograph in the spa. There is moonlight spa-ing on Sun/W/F from 11 pm - 1 am which is definitely worth arranging travel to accommodate - hotel guests only on Sun/F, and Wednesday for non-hotel guests. There is NO absolutely NO talking allowed during the moonlight spa; but, you’re able to enjoy the outdoor pool under the stars, and it’s breathtaking. The spa is open to non-guests of the hotel, but check the times and dates. You can enjoy the spa even if you do not stay there (it can be busy at times). Guests have expanded times that they can spa - mornings and night. Besides the thermal baths, you can access the usual spa treatments in the ESPA facilities. One of us had a body scrub which was an interesting experience given we were not asked nor did we clarify the gender of our therapist and it was a HIM. If you’re sensitive to this, make sure you specify the gender you prefer for treatments. He was fantastic, but it was uncomfortable since the preference would have been to have a female body scrubber - I mean, you know how that scrubbing thing is….. That said, this was not a body scrub like you might find in Koreatown (Los Angeles): It was a very modest approach with deft manipulation of blankets and towels to limit exposure and the scrub was with a brush. We chose the LONG route. Our Journey to Vals started in Milan. We stopped for lunch at a quaint restaurant Locanda Orico. https://www.locandaorico.ch in Bellinzona (CH). From there we started to twist through the mountains and through a lot of road construction (adding time to our journey). Even though the drive was long the lush landscape, waterfalls and animals were a treat for two city girls. From what we understand the drive from Zurich is about 2.5 hours and mostly motorway until the base of the mountain and then you climb up.